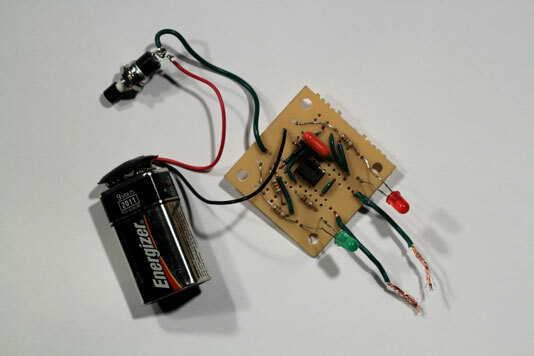 Building an electronic coin-toss is a good project for a beginning electronics hobbyist. Prior to building the coin-toss on a printed circuit board (PCB), it is advisable to prototype it on a solderless breadboard. Once you’re happy with your prototype, here are the steps for building the coin-toss circuit on a PCB. Break the PCB in half. Break the board in half and save the other half for another project. To break the board, just grab an end in each hand and snap it in two. Insert the 555 timer IC. Remember that the dot or notch on the 555 IC marks pin 1. Install the chip so that pin 1 is in strip 4 and pin 8 is in strip 14. Solder into place. This circuit needs nine jumper wires. Cut the jumper wires from the 22-gauge solid wire and carefully strip the insulation from each end. Use needle-nosed pliers to bend the bare end of each jumper wire down, insert both ends into the appropriate holes, solder the leads to the pads, and then use your wire cutters to snip the excess. Use your own judgment to determine which hole in the indicated strip to place the jumper wire in. Whenever possible, use the shortest possible path for each jumper wire. Install each resistor into its correct location. Bend the leads down and insert each resistor into the correct holes, solder in place, and then snip off the excess wire. Install the capacitor into strips 5 and 10. Push the capacitor all the way in until it’s flush with the board. Solder the leads to the pad and trim excess wire. Connect the two segments of row 19. Insert one end of a short jumper wire into hole E19 and the other end into hole F19. This jumper wire bridges the gap between the two terminal strips in row 19, effectively making them a single terminal strip. LEDs are directional and must be installed in the correct direction or they won’t work. One lead is shorter than the other. This short lead is the cathode, and the longer is the anode. Do not push the LED in until it is flush with the circuit board. Instead, push just a little bit of the leads into the holes so that the LED stands up about an inch from the top of the board. Install the jumper wires for the metal contacts. Cut two, 2″ lengths of stranded wire and strip about 3/8″ of insulation from each end. Solder one end of each wire into holes in strips 1 and 11 and leave the other ends free. When the circuit is installed in its final enclosure, you connect the ends of these wires to the metal posts that the user will touch to activate the coin-toss circuit. Cut a 2″ length of stranded wire and strip about 3/8″ of insulation from each end. Solder one end to either terminal on the pushbutton (it doesn’t matter which). Push the other end through a hole in strip 10 and solder it in place. Connect the battery snap connector. Strip off about 3/8″ of insulation from the end of both leads. Then, solder the black lead to the free terminal on the pushbutton (the terminal you did not use in Step 9) and solder the red lead to a hole in strip 20. Connect the 9V battery to the snap connector. The red LED should immediately light up. Turn off your soldering iron. Test the circuit by pinching both of the free jumper wires between your fingers. The LEDs should alternately flash until you let go, leaving one or the other lit.